This week, SFGate reported on a phenomenon that many Muni riders know all too well: when the Clipper card reader is broken and you don’t have a Fast Pass on your card, you might get a citation from fare inspectors. But yesterday, we were informed by the SFMTA again that you shouldn’t be cited in this situation. 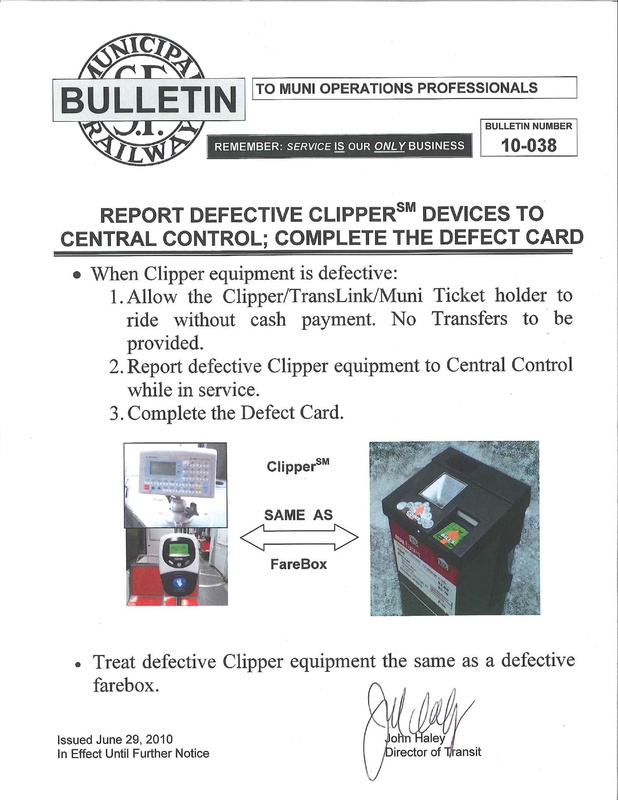 In 2010, we asked SFMTA about the policy for fares when the Clipper card reader is broken. They told us that when the machines are broken, drivers are not supposed to make cardholders pay, regardless of whether the rider has a monthly Fast Pass loaded on the card. We even got the document SFMTA says they sent to operators notifying them of this change in procedure in 2010 (see above). Has Muni’s fare policy changed since our 2010 story? Since July, 8,700 Muni riders have complained they were wrongly cited for not paying the fare, many times because of broken scanners, according to appeal records. Roughly 175 of the riders succeeded in getting their ticket dismissed. So there you go, folks. Whether the inspectors and drivers were misinformed, now you have the word (and the memo) to protest your tickets. I learned the hard way that if the machine nearest to you is broken, you ARE held responsible to find another working clipper card machine on Muni. The fare inspectors expect that you will go through the entire train looking for a working machine, and they WILL ticket you if there was a working machine somewhere on the train. Consider yourselves warned! As I said some time ago, that’s why I always keep the paper receipt I get when I load my card at Walgreens.